Surely, a well nurtured and fed \"compliance officer\" who has not got a board seat nor power could no do much, except raising alarm bells.. given the culture of even most CTO and senior most HR officers do not have board roles, means that this will not change anytime soon. What is worst is that the capital market is veered towards tactical maneuvers to produce short term results, especially for main market listed major corporations.. Surely what market needed is senior executives take on 'personal' liabilities to their decisions, in this case, like a Mr. Corzine LLP fund... then if his personal net-worth is in fact at risks.. by the decision he makes (& of course awards also), he would definitively be actively seeking AND taking heed of the feedback from the Chief Risk/compliance officer.. Sadly, all these better monitoring and ratios are still after the fact and trying to 'predict what has happened'.. what the whole capital market world desperately need is a 'predictive' eco-system, which sadly most 'power that be' are preferring the status quo.. can we blame them?? Unlike most of the top guys, these common sense approach can arguable be reach by only joe-blog like me who is not pondering from Monaco nor the Hamptons.. In short, we need a fundamental shift to the mindset and indeed the value chain before anything can be done, the well nurtured and fed compliance officers will then play a major role then, but sadly not before, as they are at present more to do what is asked & to keep the regulators happy. Warmest seasons greetings to all. "Ultimately, this is not about what really happened at MF Global between Mr. Corzine and the firm’s former chief risk officer. We will leave that to Congress, the regulators and, probably in the end, to the judicial process. Not every corporation loses track of $1 billion of customer funds; but just about every corporation has a compliance or risk officer function. So, the practical lesson from this mess is the risk associated with mishandling the compliance officer relationship. Or, more directly, the need for corporate leadership to be sensitive to the “care and feeding” of the compliance officer. For, as the news reports make so very clear, the cost of failing to do so is very high." This story relates to the YiWu college (http://www.ywu.cn/) who has nickname of being TaoBao University (equivalent of ebay university), it is not training for people to work for TaoBao, but using the TaoBao system to run business.. typically buy low sell high type of trading. the above story described how short-term the view is, if students are only trained to use the present platforms to do lifestyle business (mostly using manpower vs systems) rather than building for the future/big business, it argued that they will become unemployed/unemployable in the future. another similar story: “淘宝大学”, 一场短视教育的赌博 where it is even saying it is in fact a 'gamble' to study there.. This is very typical the challenge in China, where, the power that be might not be in the position of power long, hence they are most likely to be making 'non controversial' decisions.. to re-position the college to teach 'entrepreneurial' activities would have been a big 'leap of faith' already (I don't know the history) but in order to pass that, and get the trustees/owners to say ok, no doubt they position and customise the course in such a way that it is understood.. i.e. doing businesses on TaoBao.. it would seem that (I did see a Phoenix TV program on this topic) this was really the case, where a small proportion of students (better performing) are selected to join the more exclusive entrepreneurial course, where literally, students are encouraged AND expected to maintain their online store, source, distribute and send off orders during and after lectures.. some successful students would hire others to assist them.. more successful they are, more work they have, more things to manage, and less time to sleep NOR study... NOR relax..
the better way, some might argue (like the two articles above) would be to educate and train a 'well rounded' entrepreneur and get them ready for the wider world and able to create another TaoBao rather than 'using' TaoBao..
therefore, if this was the case, it might be a brilliant course for others to adopt not only in China/Asia but also rest of Europe and indeed UK... as it solves a big problem: Job creation! big challenge in the western world is that the work force has been 'numbed and disincentivised to work by the benefit culture (vs workfare of US). as a result, people just are NOT driven to work.. see my previous blog based on a Sunday-times article by broadcaster John Humphries. in short, it is a good 'problem' to have for Yiwu students, gamble or not gamble! Make sense.. but sadly no politician brave enough to do anything about it! "So we’re back to perverse incentives. When Beveridge wrote his report in the 1940s he saw a nation in which there were vast numbers of people who were desperate to work if only they could get a job. Now there are many who have no incentive to get one because they are better off on benefits. The Centre for Social Justice, which was set up by Iain Duncan Smith, the welfare secretary, calculates that the number of households in which no one works has doubled over the past 15 years." "What happens in a rich country when the government decides the benefits system is too generous? When Bill Clinton was president of the United States he said what no British politician would dare to say: America would “end welfare as we know it”. He declared a revolution. Instead of welfare, Americans would have “workfare”. Instead of the state paying its citizens to be idle, the citizen would have to find work. If not, the state would find something for them to do. And if they didn’t like what was on offer — sweeping up leaves, perhaps — then that’s just too bad. No work, no welfare." "Jones found that the average age at which Nobel laureates performed their prize-winning work, and the average age at which inventors had their great achievement, were both 39. The largest mass of great innovations in knowledge came in an inventor’s 30s (42%), but a substantial amount also came during their 40s (30%), and some (14%) came beyond the age of 50. Curiously, Jones found that the average age of innovators is rising. Over the last century, the average age of greatest achievement for both Nobel Prize winners and great tech inventors rose by about six years. Since 1985, it was 45. In fact, in both physics and chemistry during the past two to three decades, very little Nobel Prize–winning research has been done before age 40." "Do people stop being creative as they reach middle age? Ben Franklin certainly didn’t. He invented the lightning rod when he was 44. He discovered electricity at 46. He helped draft the Declaration of Independence at 70, and he invented bifocals after that. Henry Ford introduced the Model T when he was 45. Sam Walton built Walmart in his mid-40s. Ray Kroc built McDonald’s in his early 50s. Some of the most creative people of the century were also not young. Ray Kurzweil published The Singularity Is Near in his 50s; Alfred Hitchcock directed Vertigo when he was 59; Frank Lloyd Wright built his architectural masterpiece, Fallingwater, when he was 68. And let’s not forget the greatest innovator of recent times: Steve Jobs. His most significant innovations—iMac, iTunes, iPod, iPhone, and iPad—came after he was 45." 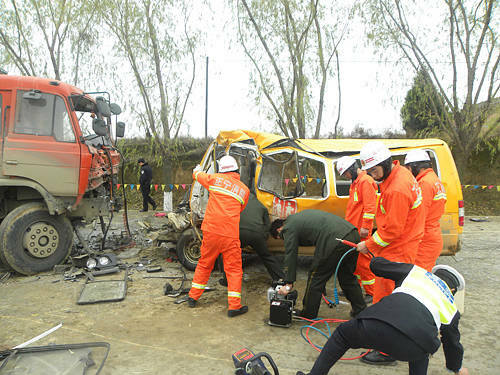 "At 9:15 a.m. on November 16, a van collided head-on with a heavy truck in Yulinzi Town, Zhengning County in Qingyang City. The van was shuttling children, accompanied by a teacher, to a private local kindergarten, and was driving on the wrong side of the road. The saddest part of this accident is that the nine-seat van, whose seats had all been removed, was crammed with 62 children. The bus driver and four children were found dead on the scene, while the teacher and 15 other children died after being sent to hospital. Thanks for Paul Wong EMBA01 support! Bosch is everywhere... 60% of Bosch may be in automobile components, but this is just a bit of the story. My new-founded respect for my extra-ordinary Bosch hedge-trimmer reflects a lot of what Paul Wong (EMBA 2001) told us on the 18th October in the EMBA club. In a lively, highly inter-active presentation, with a fair dose of humour, Paul described the M & A process that Bosch security division went through in acquiring the UK/ Canadian company Extreme CCTV. It was a surprise to us all, that Bosch was the fourth largest R and D spender globally and second in Europe through its 320 companies, and 281,000 employees, just under half of whom are in Germany, and 4,920 are presently based in the UK, including Paul's division - Bosch Security. Perhaps most surprisingly, like the giant Swiss Wilmsdorf Foundation (Rolex and Swatch), Bosch is 92% owned by a charitable foundation, really allowing it to think long term in its approach, though clearly it thinks and acts as a profitable organisation. Bosch aims for 8% annual growth, of which 3% is to be by acquisition and 5% organic growth, which Paul says since the 2nd world war it has consistently achieved. 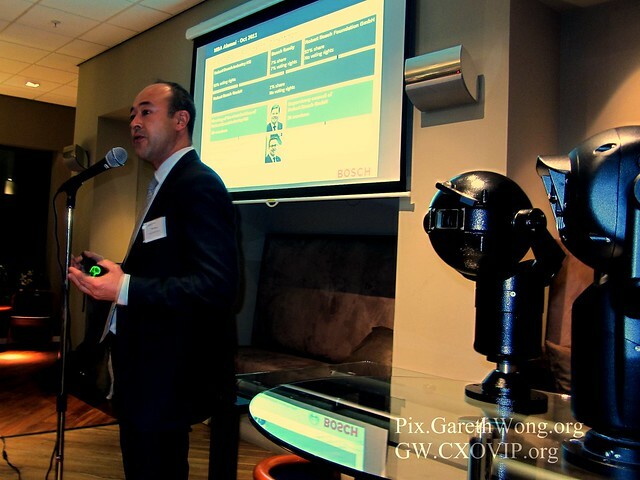 Paul was happy to report his appropriate use of CASS acquired skills (IRR/ NPV etc) on the valuation process in the Extreme CCTV acquisition, and the way Bosch grows by acquiring various young companies where through its in-built resources; it can offer scalability, economies of scale and global reach. Bosch also needs no external advisors as it has a very sophisticated in-house M and A division. Extreme had a very interesting range of CCTV products, and Paul described how Bosch can "age' products in their lab to test for durability, they rebuilt the product so it could offer better scalability. Paul was frank in the aftermath of the recession in 2008 much of the supply chain for Extreme CCTV's units was in chaos and this was one element of due-diligence that could have been better. We were handed around two very heavy products to see, ranging from £2k upto £25k these are the cameras to "watch over us" predominantly by the police and councils. Paul also showed many of the new products coming soon, devices in your Mercedes that tells the car what the speed limit it, if it is slipping lane and helping night vision that seemed extra-ordinary and additionally security devices that covered fences and alas no stop parking spaces that will automatically hit you with a ticket! Perhaps most remarkable was the technology for the police that could quickly scan footage for say a red car, saving countless hours of work, and potentially lives in searching for terrorist suspects. Paul concluded by saying in the fourth year, after re-designing the core extreme products it was now hitting positive cash-flow and delivering the full value it promised. Cass resident M &A guru, Scott Moeller - of course - led on the entertaining questions. Teenagers & kids should watch this, hope you can listen to the last comments by Aerielle... be grateful & thankful with what you have, as it might be last time you have that.